(APN) ATLANTA – Gov. Sonny Perdue delivered his annual State of the State address before a joint Session of the Georgia General Assembly on Wednesday, January 13, 2009, his last before leaving office next January. Perdue spent much of the nearly 40 minute address sermonizing and recounting moments in history when US citizens overcame adversity rather than outlining solutions to problems surrounding transportation, water, healthcare, or ethics. The governor said Georgia’s bleak economic outlook provides a new challenge for this generation. Though lawmakers made billions of dollars in spending cuts last year, the governor prepared the Assembly Wednesday to make more this year. Perdue urged members of both parties to put aside partisan stunts and work together. The governor did urge lawmakers to tackle the issue of teacher salaries, which Perdue believes are too low and serve as a disincentive for young people to join the teaching profession. Perdue offered more specifics on this idea when he spoke at the annual Eggs and Issues Breakfast at the Georgia World Congress Center on Tuesday, January 12, 2010. The governor’s vision would allow teachers to earn higher salaries based on classroom observation and student growth. The proposal would preserve the current salary structure and allow teachers to opt into the performance system when it is fully available in 2014. Perdue also spoke of the need Wednesday for the reform of the State’s mental health program. He pledged an additional investment of $20 million in 2010 and $50 million in 2011. State Labor Commissioner Michael Thurmond delivered the Democratic Party’s response at the State Capitol later in the day. Thurmond spoke in broad terms about what he said the Democratic Party of Georgia stands for: decent wages, good jobs, proper education, efficient and honest government, sound money management, and tax reform. But like the governor’s speech, Thurmond offered few specifics about how to make these ideas a reality. While he noted “the number one issue is jobs,” Thurmond argued specifically for ethics reform. Former Speaker of the House Glenn Richardson (R-Hiram) resigned his Speaker post and State House seat earlier this month after his ex-wife went on TV with emails she said proves Richardson carried on an affair with an Atlanta Gas Light lobbyist while pushing legislation that would have benefited the company. 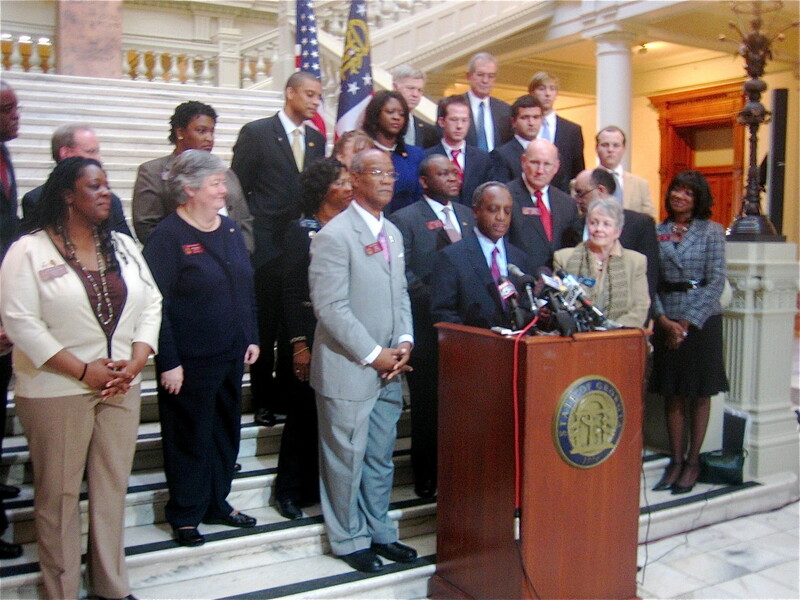 Thurmond echoed the Governor’s call for bipartisanship.